Download "We build robust, eco-friendly products, and strive to continue improving. It's our commitment, our tradition and a guiding principle of our company." 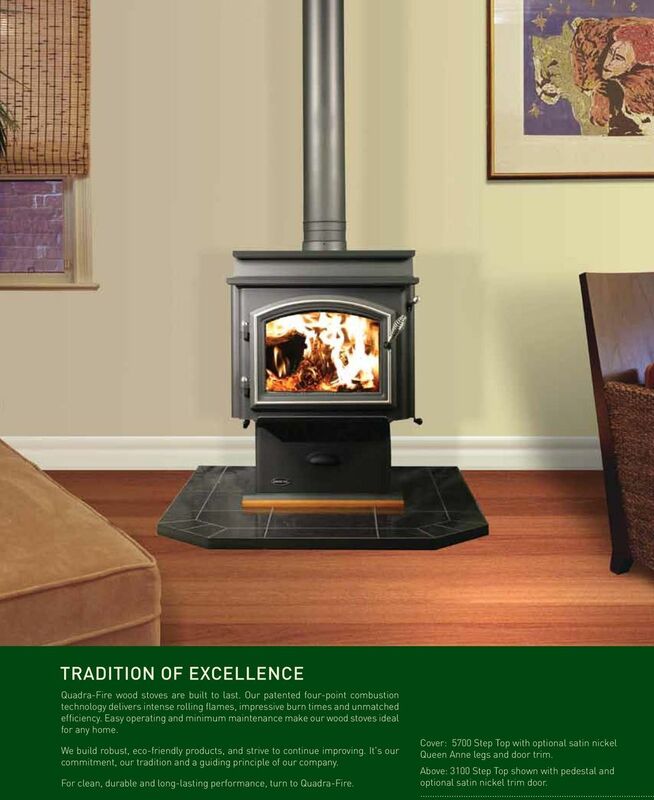 2 Tradition of Excellence Quadra-Fire wood stoves are built to last. Our patented four-point combustion technology delivers intense rolling flames, impressive burn times and unmatched efficiency. Easy operating and minimum maintenance make our wood stoves ideal for any home. We build robust, eco-friendly products, and strive to continue improving. It's our commitment, our tradition and a guiding principle of our company. 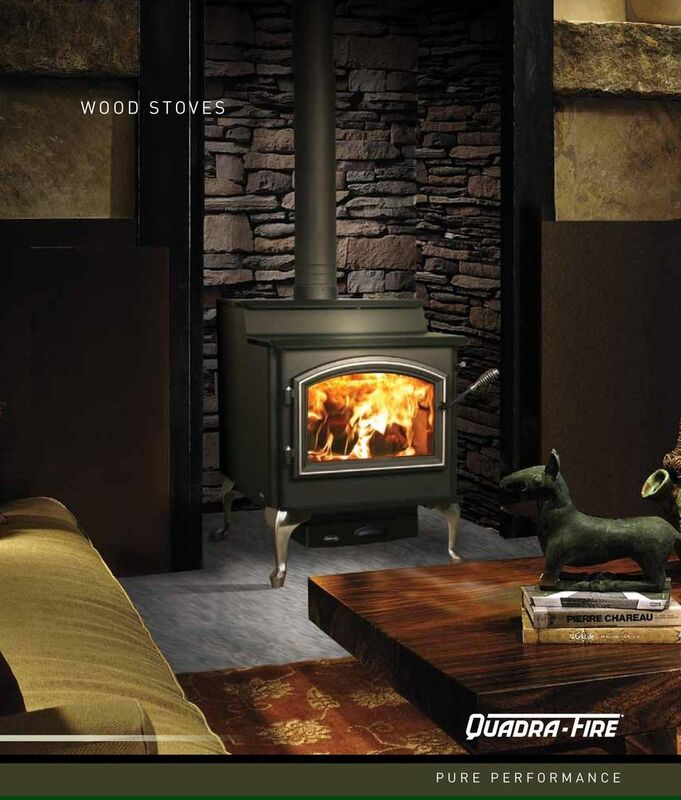 For clean, durable and long-lasting performance, turn to Quadra-Fire. Cover: 5700 with satin nickel Queen Anne legs and door trim. Above: 3100 shown with pedestal and satin nickel trim door. 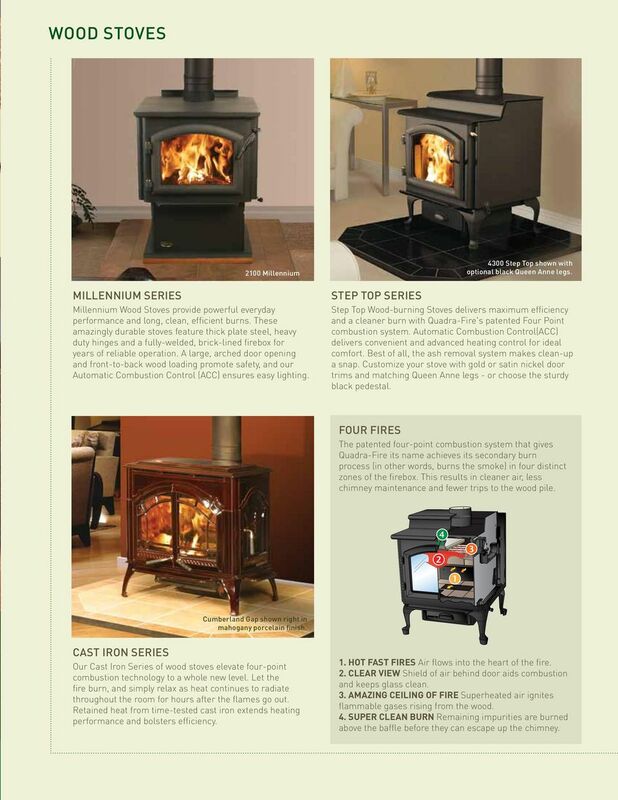 3 WOOD stoves 2100 Millennium Millennium Series Millennium Wood Stoves provide powerful everyday performance and long, clean, efficient burns. These amazingly durable stoves feature thick plate steel, heavy duty hinges and a fully-welded, brick-lined firebox for years of reliable operation. A large, arched door opening and front-to-back wood loading promote safety, and our Automatic Combustion Control (ACC) ensures easy lighting shown with black Queen Anne legs. 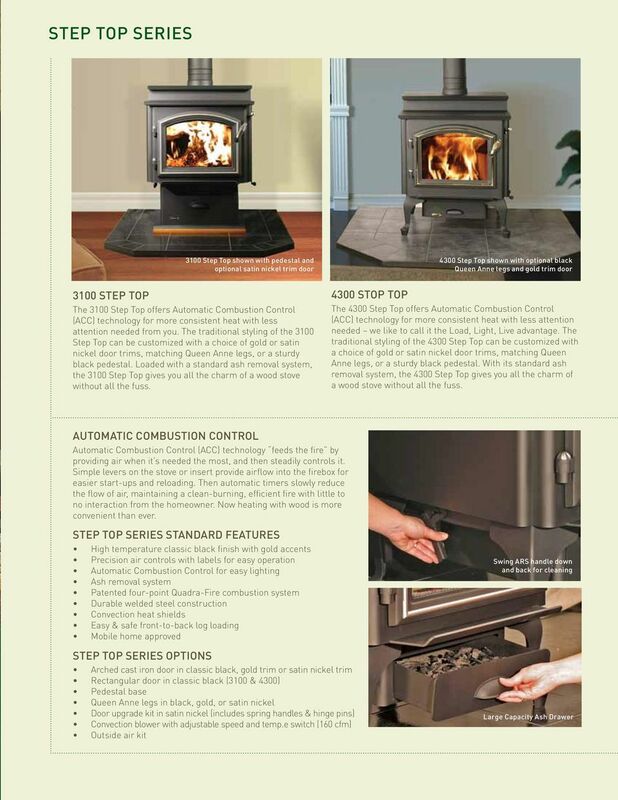 step top series Wood-burning Stoves delivers maximum efficiency and a cleaner burn with Quadra-Fire's patented Four Point combustion system. Automatic Combustion Control(ACC) delivers convenient and advanced heating control for ideal comfort. Best of all, the ash removal system makes clean-up a snap. Customize your stove with gold or satin nickel door trims and matching Queen Anne legs - or choose the sturdy black pedestal. 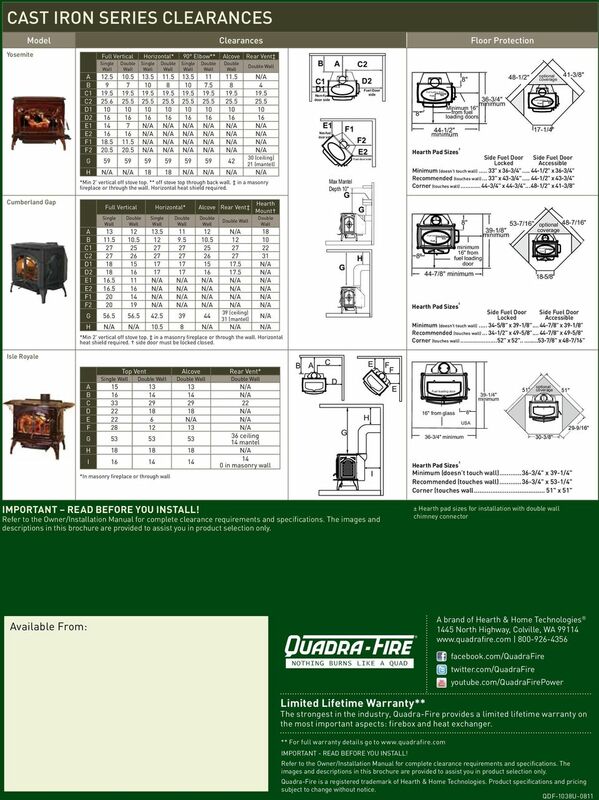 FOUR FIRES The patented four-point combustion system that gives Quadra-Fire its name achieves its secondary burn process (in other words, burns the smoke) in four distinct zones of the firebox. This results in cleaner air, less chimney maintenance and fewer trips to the wood pile. Cumberland Gap shown right in mahogany porcelain finish. 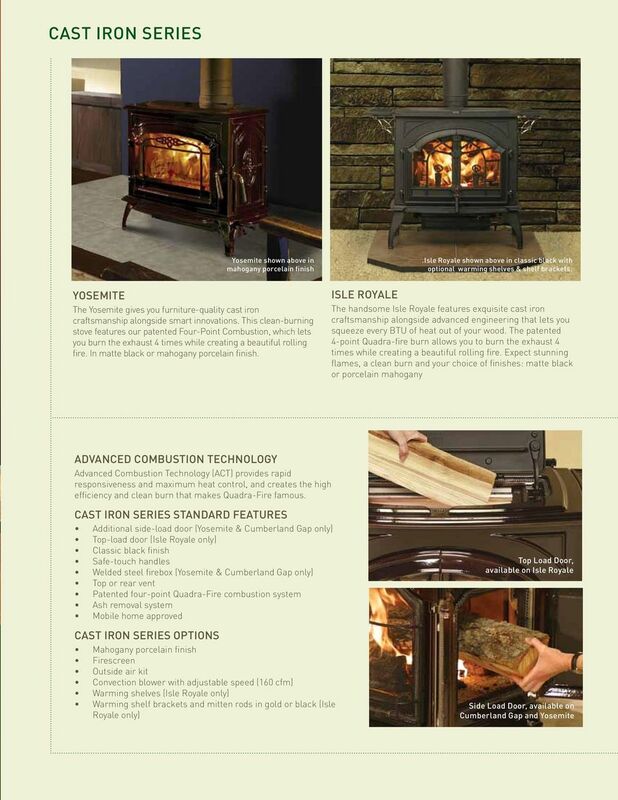 cast iron series Our Cast Iron Series of wood stoves elevate four-point combustion technology to a whole new level. Let the fire burn, and simply relax as heat continues to radiate throughout the room for hours after the flames go out. Retained heat from time-tested cast iron extends heating performance and bolsters efficiency. 1. HOT FAST FIRES Air flows into the heart of the fire. 2. CLEAR VIEW Shield of air behind door aids combustion and keeps glass clean. 3. AMAZING CEILING OF FIRE Superheated air ignites flammable gases rising from the wood. 4. SUPER CLEAN BURN Remaining impurities are burned above the baffle before they can escape up the chimney. 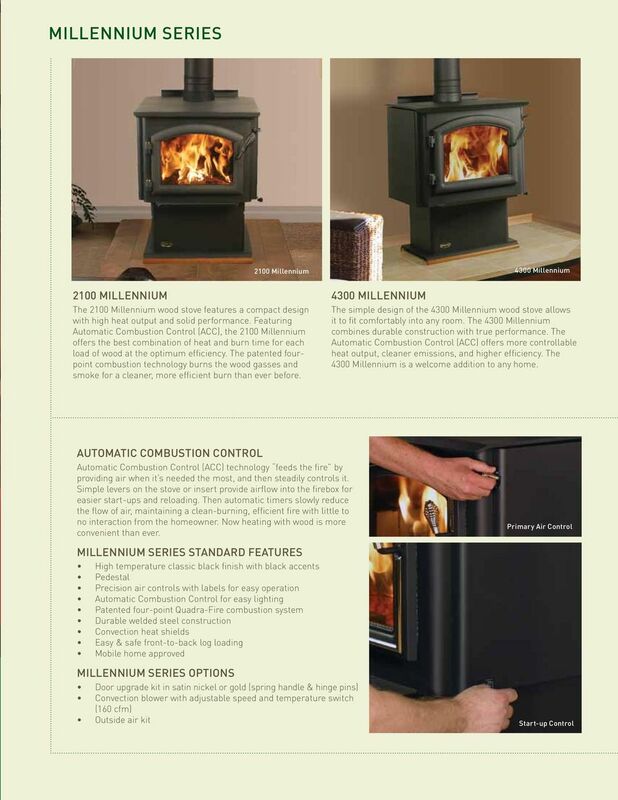 4 3100 Millennium The 3100 Millennium wood stove is designed to deliver powerful performance every day. The durable construction features a fully welded, brick-lined firebox with thick plate steel and heavy duty hinges. Combined with Quadra-Fire s exclusive Automatic Combustion Control (ACC) technology, precision airflow management is delivered for longer, cleaner and more efficient burns. 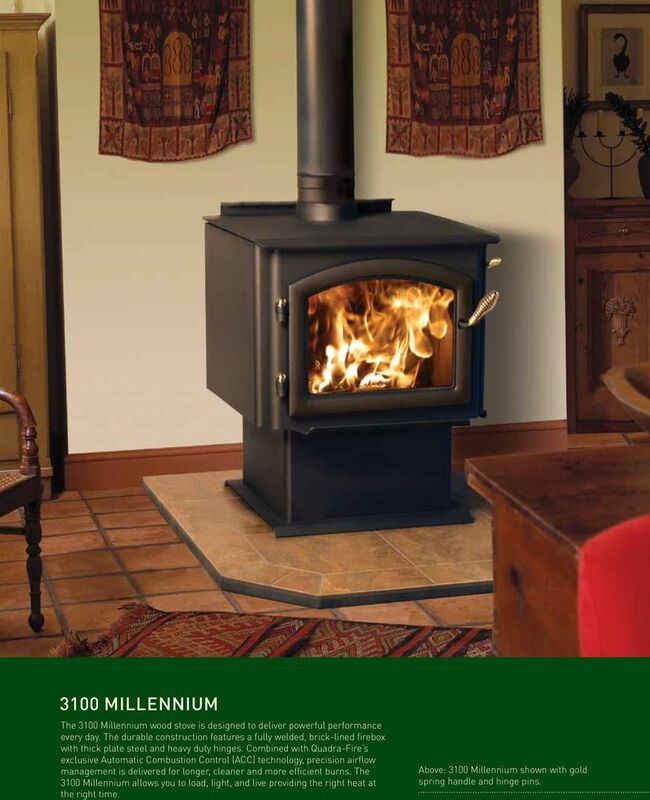 The 3100 Millennium allows you to load, light, and live providing the right heat at the right time. Above: 3100 Millennium shown with gold spring handle and hinge pins. 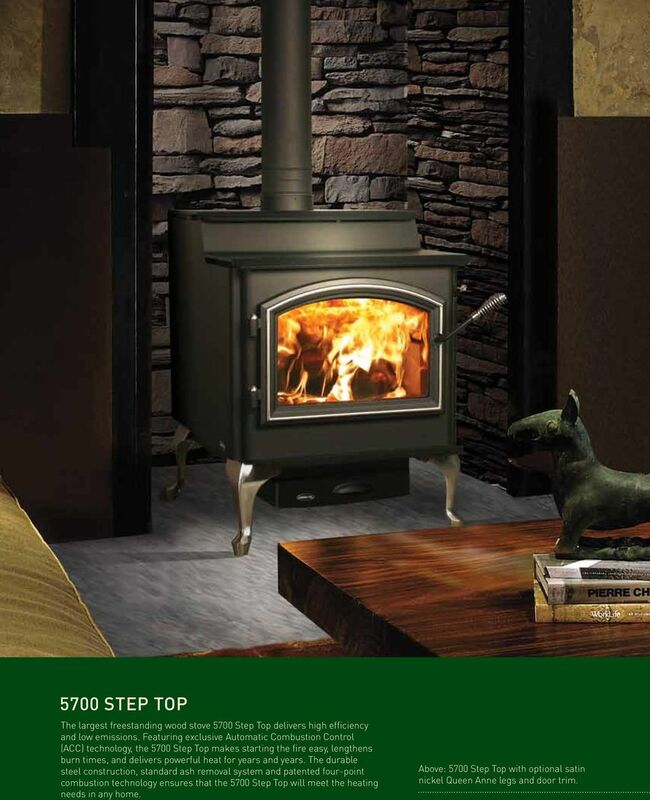 6 5700 The largest freestanding wood stove 5700 delivers high efficiency and low emissions. Featuring exclusive Automatic Combustion Control (ACC) technology, the 5700 makes starting the fire easy, lengthens burn times, and delivers powerful heat for years and years. The durable steel construction, standard ash removal system and patented four-point combustion technology ensures that the 5700 will meet the heating needs in any home. Above: 5700 with satin nickel Queen Anne legs and door trim. 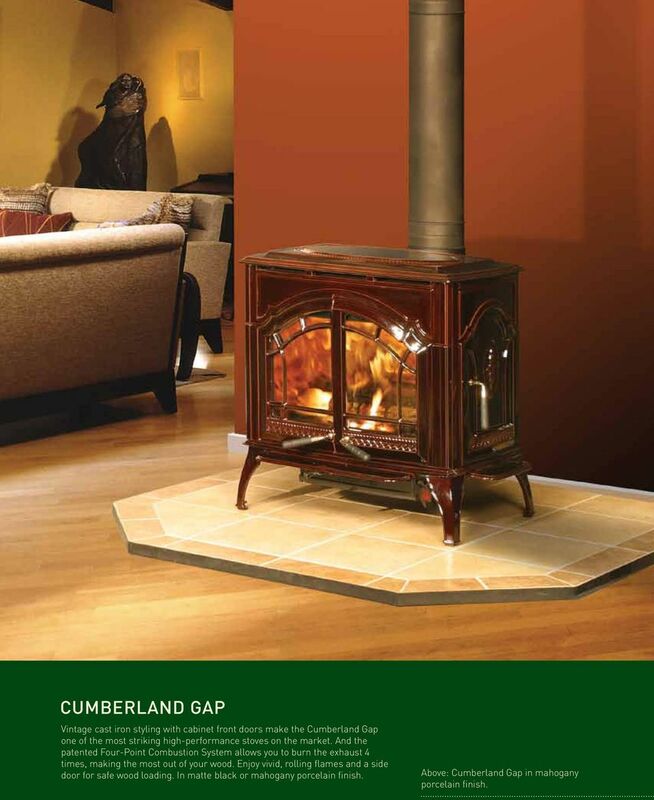 8 cumberland gap Vintage cast iron styling with cabinet front doors make the Cumberland Gap one of the most striking high-performance stoves on the market. And the patented Four-Point Combustion System allows you to burn the exhaust 4 times, making the most out of your wood. Enjoy vivid, rolling flames and a side door for safe wood loading. In matte black or mahogany porcelain finish. Above: Cumberland Gap in mahogany porcelain finish. 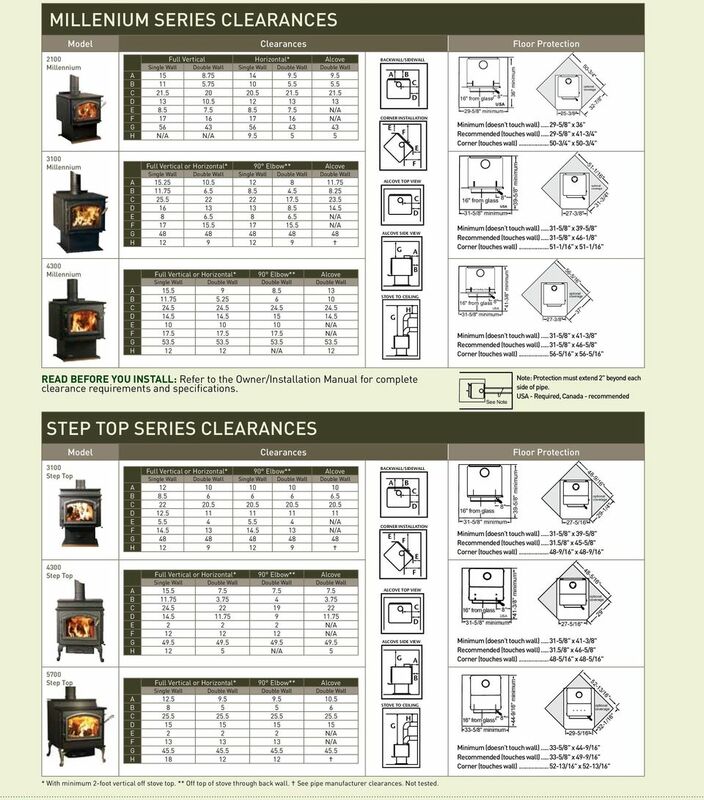 10 technical information WOOD Stoves Specifications Technical Data Performance Width (inches) Height (inches) Depth (inches) Weight (lbs) Peak Btu/hr* (On High) Max. Burn Time (On Low) Firebox Capacity (cu. ft.) Max. Log Length Emissions (g/hr) Efficiency 2100 Millenium 26-7/ / / , hrs " % 3100 Millenium / , hrs "/ 16" Ideal % 4300 Millenium / , hrs "/ 18" Ideal % / / , hrs "/ 16" Ideal % / / , hrs "/ 18" Ideal % / / , hrs "/ 22" Ideal % Yosemite 25-5/8 24-5/ , hrs " % Cumberland Gap 27-7/ / / , hrs " % Isle Royale / , hrs " % heating capacity* 2100 Millenium 3100 Millenium 4300 Millenium Yosemite Cumberland Gap Isle Royale Peak BTU/Hr Output 40,800 51,100 56,000 51,100 56,000 70,300 42,500 63,900 66,700 Heating Capacity* (Sq. ft.) Up to 2,100 Up to 2,600 Up to 3,000 Up to 2,700 Up to 3,000 Up to 3,700 Up to 2,200 Up to 3,400 Up to 3,400 *Represents a well insulated home with low ceilings in a mild climate. 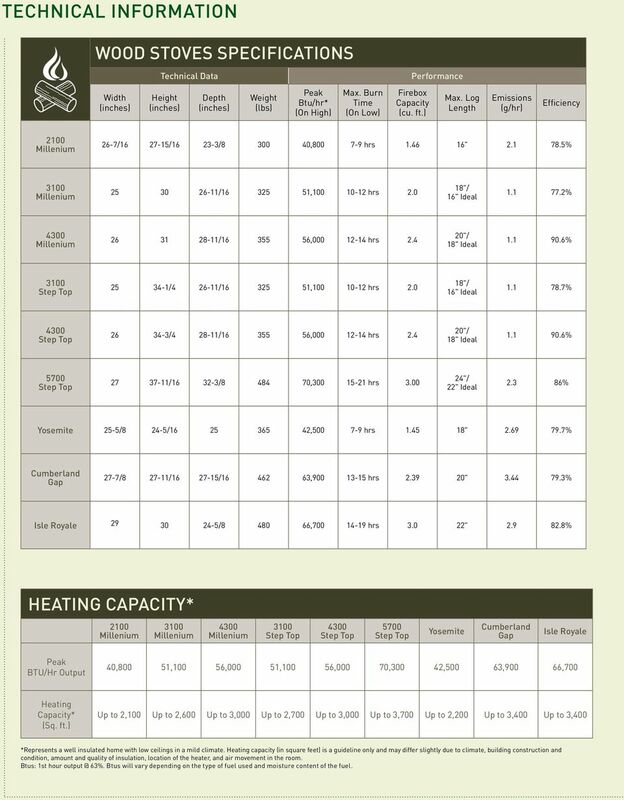 Heating capacity (in square feet) is a guideline only and may differ slightly due to climate, building construction and condition, amount and quality of insulation, location of the heater, and air movement in the room. Btus: 1st hour 63%. Btus will vary depending on the type of fuel used and moisture content of the fuel. 11 Millenium series clearances Model Clearances Floor Protection 2100 Millennium Full Vertical Horizontal* Alcove Single Wall Double Wall Single Wall Double Wall Double Wall A B C D E N/A F N/A G H N/A N/A Millennium Full Vertical or Horizontal* 90 Elbow** Alcove Single Wall Double Wall Single Wall Double Wall Double Wall A B C D E N/A F N/A G H Millennium Full Vertical or Horizontal* 90 Elbow** Alcove Single Wall Double Wall Double Wall Double Wall A B C D E N/A F N/A G H N/A 12 BACKWALL/SIDEWALL A B C D CORNER INSTALLATION E F E F ALCOVE TOP VIEW C D ALCOVE SIDE VIEW G A B STOVE TO CEILING H G 16" from glass 8" USA 29-5/8" minimum 16" from glass 8" USA 31-5/8" minimum Fuel loading door 16" from glass 8" USA 31-5/8" minimum 41-3/8" minimum 36" minimum 39-5/8" minimum 27-3/8" 25-3/8" 27-3/8" 56-5/16" 37" 50-3/4" 32-7/8" Minimum (doesn t touch wall) /8" x 36" Recommended (touches wall) /8" x 41-3/4" Corner (touches wall) /4" x 50-3/4" 51-1/16" 31-3/4" Minimum (doesn t touch wall) /8" x 39-5/8" Recommended (touches wall) /8" x 46-1/8" Corner (touches wall) /16" x 51-1/16" Minimum (doesn t touch wall) /8" x 41-3/8" Recommended (touches wall) /8" x 46-5/8" Corner (touches wall) /16" x 56-5/16" READ BEFORE YOU INSTALL: Refer to the Owner/Installation Manual for complete clearance requirements and specifications. step top series clearances See Note Note: Protection must extend 2" beyond each side of pipe. USA - Required, Canada - recommended Model Clearances Floor Protection 3100 Full Vertical or Horizontal* 90 Elbow** Alcove Single Wall Double Wall Single Wall Double Wall Double Wall A B C D E N/A F N/A G H Full Vertical or Horizontal* 90 Elbow** Alcove Single Wall Double Wall Double Wall Double Wall A B C D E N/A F N/A G H 12 5 N/A Full Vertical or Horizontal* 90 Elbow** Alcove Single Wall Double Wall Double Wall Double Wall A B C D E N/A F N/A G H BACKWALL/SIDEWALL A B C D CORNER INSTALLATION E F E F ALCOVE TOP VIEW C D ALCOVE SIDE VIEW G A B STOVE TO CEILING H G 39-5/8" minimum 48-9/16" 8" 16" from glass 31-5/8" minimum 27-5/16" Minimum (doesn t touch wall) /8" x 39-5/8" Recommended (touches wall) /8" x 45-5/8" Corner (touches wall) /16" x 48-9/16" 16" from glass 8" USA 31-5/8" minimum 41-3/8" minimum 27-5/16" 48-5/16" 29-5/16" Minimum (doesn t touch wall) /8" x 41-3/8" Recommended (touches wall) /8" x 46-5/8" Corner (touches wall) /16" x 48-5/16" 16" from glass 8" 33-5/8" minimum 44-9/16" minimum 29-1/4" 29" 52-13/16" 32-1/16" Minimum (doesn t touch wall) /8" x 44-9/16" Recommended (touches wall) /8" x 49-9/16" Corner (touches wall) /16" x 52-13/16" * With minimum 2-foot vertical off stove top. ** Off top of stove through back wall. See pipe manufacturer clearances. Not tested. INSTALLATION SPECIFICATION SHEET These instructions must be used in conjunction with the 'General Installation Instructions' for MASPORT wood fires. THIS BOOK CONTAINS IMPORTANT INFORMATION. PLEASE KEEP IT IN A SAFE PLACE FOR FUTURE REFERENCE.